The evidence to day isn’t that definitive. Economists agree there is a relationship between inflation and unemployment, but the evidence for the link between minimum wage and unemployment is foggy at best. To date, most literature suggests there is a trade off, that by increasing the minimum wage it puts upward pressure on unemployment. However, no one knows by how much. I like when this blog is about charts. I don’t like when this blog uses charts as a flimsy pretext to spout off about politics. Also worth considering the nature of minimum wage jobs and from whose pocket the increase in wage is being taken. If you presume most min wage jobs are service-industry, the it’s safe to say that money is coming from small-business owners and managers who have little ability to pass increased costs along to customers or franchises – i.e. the middle class. It would be interesting to see you post a chart showing correlation between min wage increases and executive pay and also with changes in the size of the middle class. Minimum wage payment increases have to come from somewhere. The cost of living varies so much around this vast country (the USA). I’m more in favor of cities setting higher minimum wages, like San Francisco at $10.55 and hour, or San Jose at $10/hr. Maybe $7.25/hr ($15k/yr) is actually above the poverty line in Podunk-nowhere, middle-of-the-USA. It certainly isn’t in pricey SF or SJ, so those cities adjust. If there are no negative effects, then why not make the min wage $100/hr? Legislate that! Make it so! What’s so special about $9?? I can have my hours reduced to almost nothing and not be unemployed, by definition. Call up a McDonald’s in Harlan County, KY, where unemployment is well above the national average. Ask the owner how he will adjust to the minimum wage increase. Ask the assistant manager who just got promoted to $12/hour how he feels about having his wage cut to $10.10 to help pay for his co-worker’s minimum wage increases. (This is what even LEFT-WING think tanks admit will happen, Google “wage compression.”) Call up politicians in American Samoa (who are also affected by the legislation) and ask them why they lobby to get out of the minimum wage every year if it’s such a great idea for their citizens. 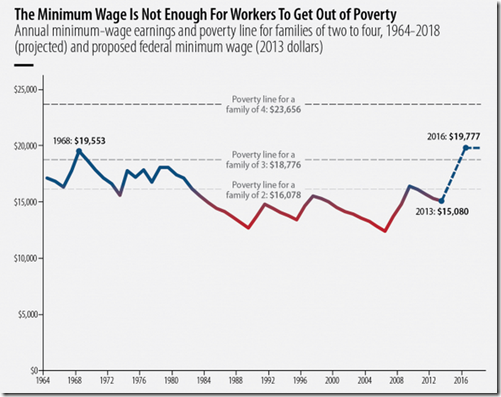 Most discussions of minimum wage fail to take into account the 40+ million on food stamps plus their ability to receive the Earned Income Credit. This usually takes someone making $17,000 a year to over $27,000 a year. What about all entry-level jobs? Let’s say, how do the younger citizens are expected to get necessary skills if the minimum wage will prevent them from being hired at all? Despite what the far left claims, price controls do distort the markets and lead to (un)intended consequences. What about the counter arguments against the minimum wage laws? Or do you honestly believe that by sitting inside the progressive bubble you will change the reality outside? I like this website for the charts, not the politics! Minimum wage is supposed to be for those starting out, who don’t have any usable skills or real-life experience outside the classroom, not for raising a family. If you are still making minimum wage after a year or two at the same job, then the problem is YOU, not the job. “Minimum wage” is what your grandparents used to refer to as “an opportunity”. Raising the min wage is a terribly inefficient way to help the poor. Politics aside, all you people hating on the idea of increasing the minimum wage need to answer why you think we happen to have the perfect amount right now? The current minimum wage has no logic or reasoning behind it! It’s not a market-based number, nor is it based off cost-of-living. It’s totally arbitrary. If raising it is such a bad idea, why give in to the status quo? why not abolish the minimum wage and let the “invisible hand” determine people’s wage? Developed countries have all introduced minimum wages, so why did they introduce it in the first place? Because the idea was to provide a living wage! So why just take half measures with some arbitrary number? You want to know what the REAL “minimum wage” is, once you price labor too high for the employers to afford it? Zero. That reality has nothing to do with politics and is all about math. The money to pay workers has to come from somewhere, and the only option once the costs of labor goes up is to either increase prices (which makes EVERYTHING more expensive) or lose money. While governments clearly don’t care about balancing their budgets, businesses operating in the real world don’t have that luxury. Businesses do not come into existence to offer jobs, they are created to make money. Labor is just one of the many costs that have to be taken into account, and making it more expensive causes prices paid by the consumer to rise, no matter what the business has to offer, from burgers to jumbo jets. If you think executives make too much, remember that the skill set needed to operate large companies profitably is greatly different than that required to sweep floors or flip burgers. You know graphic design but haven’t a clue about economics, you really should stick to what you know and not make a fool of yourself. It’s hilarious how people get all worked up about inflation and the integrity of market based incentives when we talk about the minimum wage, but make barely a peep while we’ve had a near-zero federal funds rate for banks for 6+ years, and $85 billion/month in support of bonds and mortgage backed securities. When the government makes capital free what effects do you think that is going to have on the labor market? It’s pretty clear that most of you don’t bother to read the articles I link to (or anything else that doesn’t agree with your preconceptions), and think because you passed your high school economics class you understand how the real world works. That’s ok. It’s the internet. We don’t have to agree with each other. This is a fun blog on a variety of topics – not an economics class. Hopefully the stuff I post here is provocative and makes you curious enough about topics to go out and do your own research. If you let one chart and a few lines of text determine your outlook on anything, you’re an idiot. I employ people in a flyover state and if the minimum wage here goes up to $15 per hour I can either lay people off and import parts or watch my customers leave for fully assembled imports. The idea the minimum wage doesn’t cause job loss is very damaging to job creation. The reason it’s hard to measure is two fold. First, the increases are often well behind the employment curve so only a small percentage of people are affected. Second, the increases are usually small so the signal gets buried in noise. You have a nice blog but the comments are open and so I note that I think you last two statements are wrong. I care very much for my employees so much so I’d rather have them the robots or imports. So I do much back when people wrongly try to destroy their jobs. I haven’t noticed anything on your charts about the damage the Fed is doing but am happy to agree that it is damaging to the labor market as well as causing significant wealth reallocation to the already wealthy in many cases. I’m no economist but how does raising the minimum wage help the unemployed? They have no wages to raise. Why the notion of a minimum wage is a dumbass idea. It does kill jobs, it has always killed jobs and it always will kill jobs, despite Dustin’s hypocritical rant about only reading those people/ideas that agree with one’s preconceived ideas. Dustin gets a whiff of a clue as he rants about a “near zero Fed funds rate for nearly 6 1/2 years”, follow that thought to it’s logical conclusion and you solve a raft of problems including issues having to do with workers enjoying a living wage.